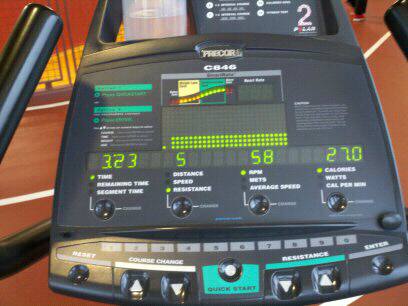 Sitting on the recumbent bike before my Pilate's class sweating it out. I'm feeling so much better as each day passes. I must say the worst part of this cold is the sudden coming on of uncontrollable coughing. I had another embarrassing moment today while in the lobby of the gym. A tickle in my throat took over and I couldn't stop coughing. I went for my water bottle and that didn't seem to help so I went to the bathroom and coughed for what felt like an eternity. After gaining some composer I made a beeline (Sp?) for the coffee in the lobby.....ahh that was the cure. Other than the embarrassing cough I feel great. Tomorrow is my 4 - 5 mile run day on the training schedule. Signing off. First glance...and I thought you had burned 270 calories in 3minutes!!! HAHA...that would be impressive..but you are impressive!! Glad to hear you are 'back in the saddle' and getting better! Thank you for your compliments on being 'impressive'. I'll let you in on a little secret: I didn't sweat so much :-) I took it easy on the bike and in addition there was a fan pointed directly at me :-) Now tomorrow with my 4 - 5 mile run I will be sweating it out.